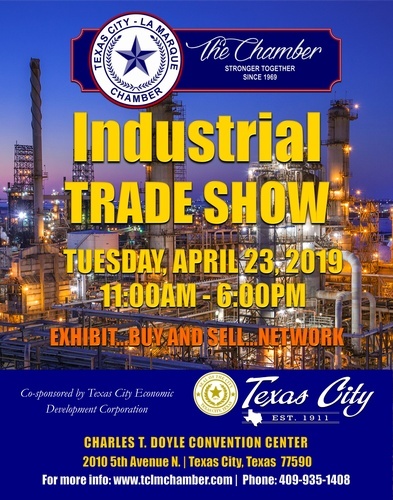 The Industrial Trade Show is hosted by the Texas City-La Marque Chamber of Commerce and the Texas City Economic Development Corporation . It is designed to increase local business by providing a place where vendors can set up display booths and distribute information about their goods and services. Potential buyers, including large corporations from the Galveston County area, are invited. Booths are offered to Chamber members on a first-come first-served basis at a rental fee of $750.00 per exhibitor. Each exhibitor will be given tickets for advance distribution. The trade show is a perfect opportunity for Chamber members to invite engineering, maintenance, operations, purchasing and business personnel from the local community to discover what each exhibitor has to offer. Due to high demand, the contract and payment must be received at the Chamber office by March 27, 2019 unless previously sold out. Main Hall is restricted to Industrial Businesses only. Door prizes and promotional advertising giveaways are being offered throughout the event, and refreshments and lunch will be served. There will be a brief orientation at the Charles T. Doyle Convention Center on April 23th at 10:00 a.m.